One cold and blustery day recently, I randomly decided that I wanted to make chili. That might sound like an ordinary thought to many of you, but it struck me completely out of left field. I don't like beans, I've never made chili, and it's never really been a part of my life, so I was caught a bit off guard. Life has taught me that when I have a strong impulse, I'm usually on the right track, so I went for it. But this post isn't about chili. As I was thinking about how I was going to make a beanless chili (more on that soon), I happened to see Maggie's post on Blue Corn Muffins with Chile and Cheese. Not only did they sound like the perfect complement to the chili, but I happened to have all the ingredients on hand. I get a lot of joy out of making food in unexpected colors (blue muffins? yes please), so I was bummed that I only had yellow cornmeal, but it tasted so good that in the end I didn't care. They may look a little plain, but they really are anything but. These reheat really well, too. 12 muffins may or may not have disappeared over the course of about 12 hours. Thanks for sharing, Maggie! 1. Preheat oven to 375 degrees. Grease muffin tins well or insert paper liners. 5. Stir in the corn, cheese, chiles and mix well. 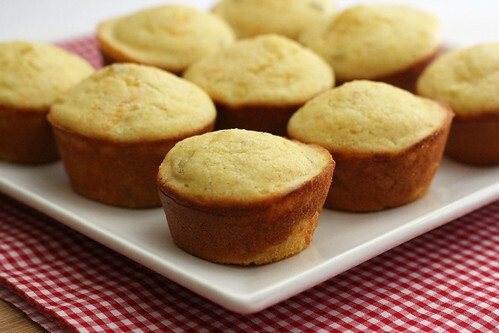 Spoon the batter evenly into muffin tins. Bake about 25 minutes, until just firm. Serve warm with butter. Here's the thing about these muffins, which is good AND bad: whatever you serve them with will be immediately forgotten. I mean, I've made some mean soups and chilis in my day, but no one ever remembers them when I make these muffins alongside it. They're that good. These corn muffins look great to me, but I once made corn muffins with bacon, onions, and pieces of corn in them, and my picky boyfriend refused to eat them. Maybe I can get these past him if I just leave out the corn -- although that sounds like one of the best parts (after the cheese) to me!